Bengaluru FC boys came from behind to secure a 3-1 win over Raman Sports Academy in their sixth game in Group B of the Bengaluru Zone in the Hero Sub-Junior League, at the Bengaluru Football Stadium, yesterday. 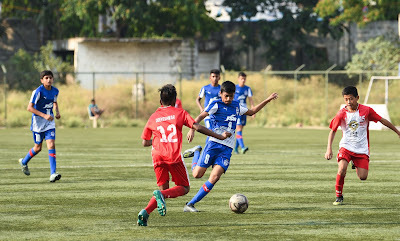 The win sealed a top place finish in Group B of the Bengaluru Zone for the Young Blues (18 points) who qualified for the final phase of the competition with an unassailable lead at the top with two rounds to go. Raman Sports Academy would deny the young Blues on multiple occasions but mistakes from goalkeeper Arnav Sharma would cost them in the final ten minutes. Unable to judge the direction of a cross from Ishaan, Arnav fumbled at the near post, gifting Bengaluru a lead with four minutes left to play. The ‘keeper would be in the thick of the action once again as Yodhin’s long-range effort would slip through his grasp and roll past the goal-line, handing the young Blues all points for a sixth game on the trot.